Kimonos aren't just summer pieces for me. I like to wear them in spring and autumn too! They just add an extra level of interest to an otherwise plain shorts and tee outfit. 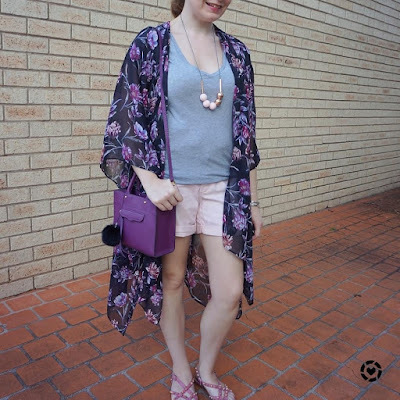 With the outfits below, I picked a kimono where the print matched the colour of the tee I was wearing. You know I like a little matchy-matchy! 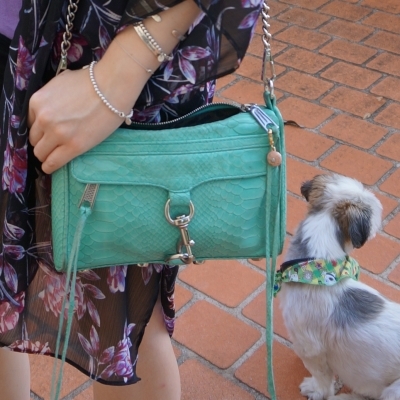 It's not the first time I've worn this aquamarine bag with purple, I really like the combination. 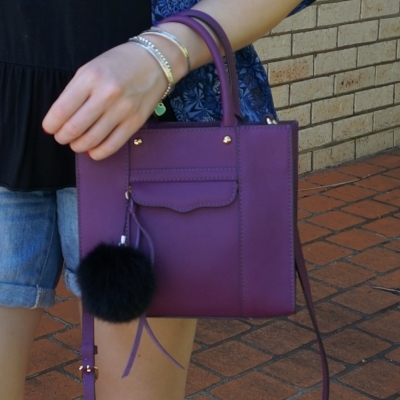 It was the perfect accessory to pair with the purple v-neck tee and the purple floral kimono. Busy morning with a few errands to run and a quick dentist appointment for toddler T before his swimming lessons. He did really well, helped I'm sure by the fact that they were playing Paw Patrol on the TV in the ceiling, he just laid back and watched the show the whole time, haha! 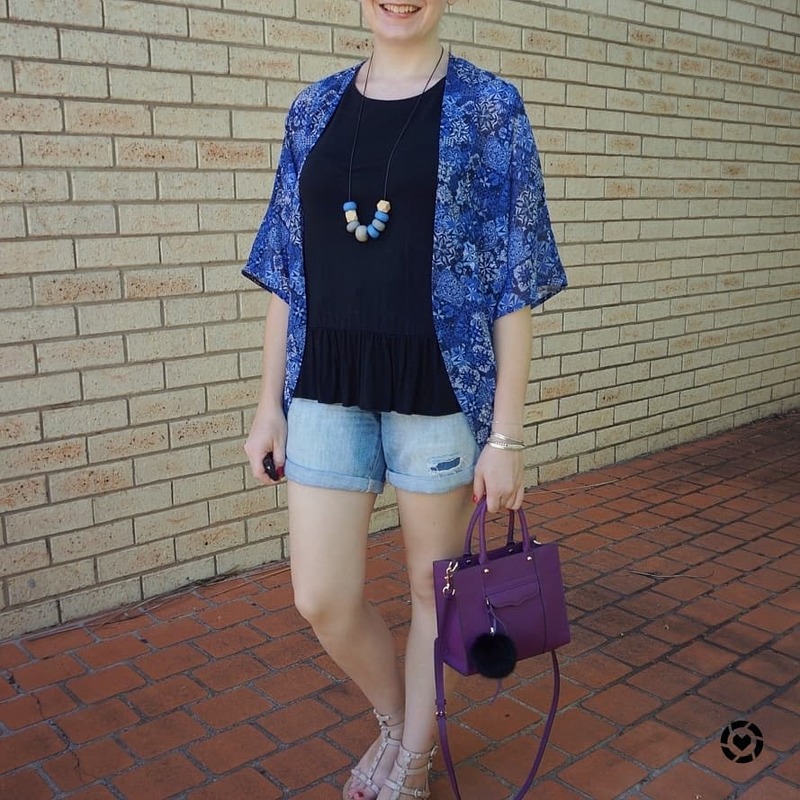 Last worn: purple floral kimono, navy tassel necklace, lilac v-neck tee, black denim shorts, Havaianas, Rebecca Minkoff mini MAC. 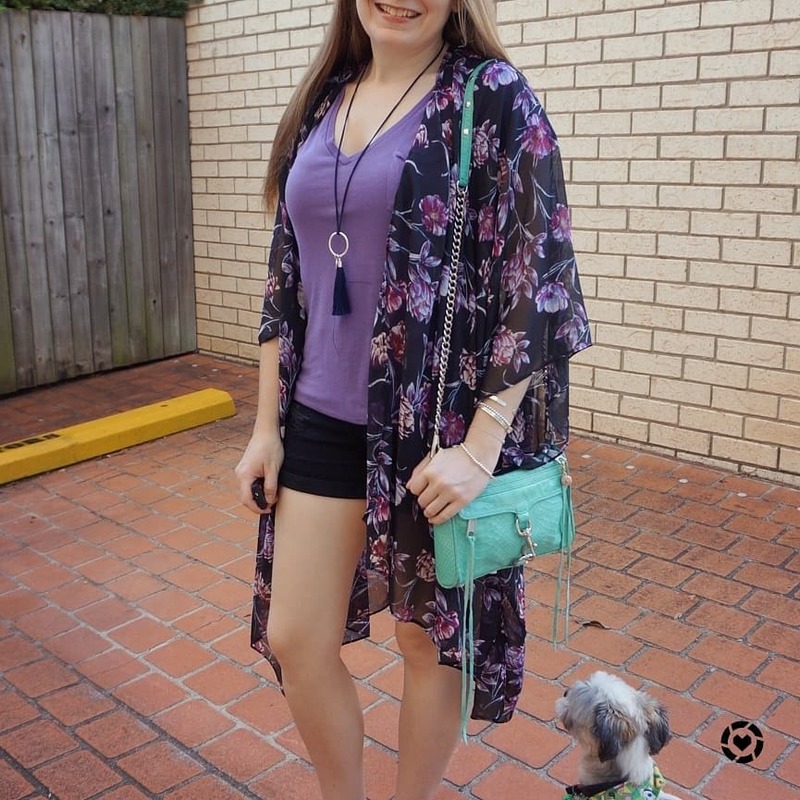 Other ways to wear: purple floral kimono with black tee, lilac v-neck tee and maxi skirt, black denim shorts and printed tee, Rebecca Minkoff mini MAC and maxi dress. Perfect for pregnancy: lilac v-neck tee in second trimester, Rebecca Minkoff mini MAC in third trimester. Another day with the kids trying to run errands meant another simple outfit was needed. When I got this coral tee home after picking it up in the sales, I knew I had to try this outfit combination with it, and wore it just a couple days after buying the tee. The bright coral colour was such a good match for the orangey reds in the print of this Kindness collective kimono! Such a winning combination paired together. 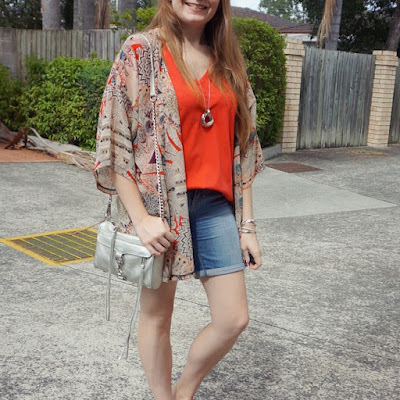 While it wasn't a very exciting day, I did love wearing this outfit and I am sure to try pairing this coral tee and the printed kimono together again soon! Such a fun bit of matchy-matchy-ness! Stuck with silver for the accessories, with the silver pendant necklace and Rebecca Minkoff mini MAC bag to be a balancing neutral for all the colour and print. 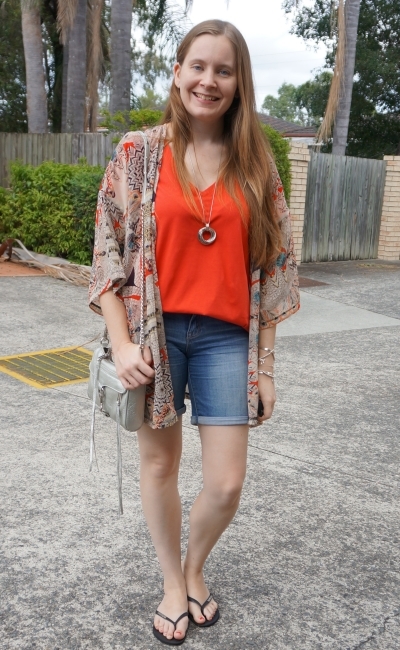 Last worn: kindness kimono, silver circle necklace, coral v-neck tee, Bermuda denim shorts, Havaianas (above), Rebecca Minkoff silver mini MAC. Other ways to wear: kindness kimono with olive shorts, coral v-neck tee and maxi skirt, Bermuda denim shorts and scarf, Rebecca Minkoff silver mini MAC and boho dress. Perfect for pregnancy: Bermuda denim shorts in third trimester, Rebecca Minkoff silver mini MAC in third trimester. Shorts and a tee is such a staple outfit. 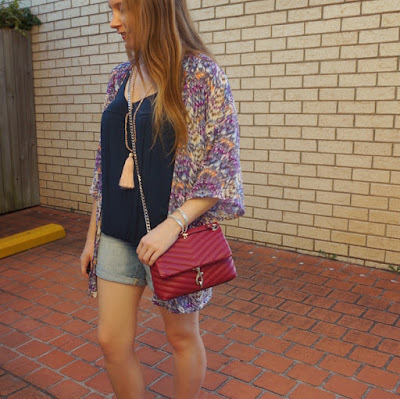 To add a little extra interest to your outfit, you can put a fun printed kimono on top. It's a nice way to change up the look of a shorts and tee outfit without much fuss. If you're unsure, you can always pick a kimono with a print that matches the colour of the tee you're wearing for an easy, cohesive look. Linking up with Trendy Thursday, Flashback Fashion, Fancy Friday, Fabulous Friday Lizie In Lace, Friday Faves. Unlike the last time I wore this kimono, I didn't need it for sun protection! I was studying for my big exam and feeling the pressure with a few days to go. With the humidity and threat of further rain, I decided to take them indoors and we headed to the local McDonald's playground! I was suitably sugared up for studying with a massive hot chocolate as the boys played in the playground. We ended up having lunch there too before heading home. The longer sleeves on this kimono worked perfectly for spending a couple of hours in the aircon studying. It adds a fun touch of colour with the black tee too, and I think the magenta worked so nicely with the turquoise bag and necklace. 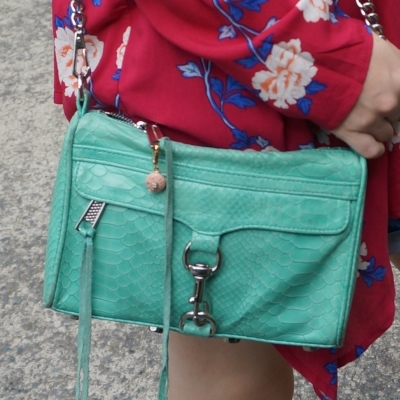 I just had to match the necklace and bag together, you know I love a bit of machy-matchy. Last worn: floral kimono, turquoise tassel necklace, black tee, Bermuda denim shorts, Havaianas, Rebecca Minkoff aqua mini MAC. 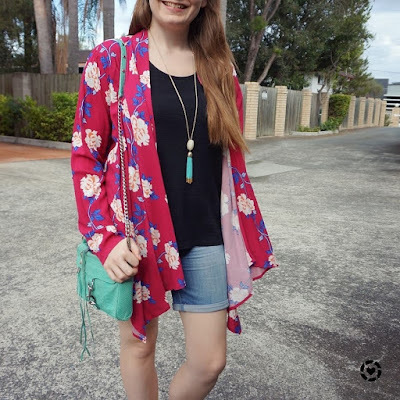 Other ways to wear: floral kimono with white tee, black tee in monochrome outfit, Bermuda denim shorts worn 30 ways, Rebecca Minkoff aqua mini MAC and maxi dress. Perfect for pregnancy: Bermuda denim shorts in third trimester, Rebecca Minkoff aqua mini MAC in second trimester. 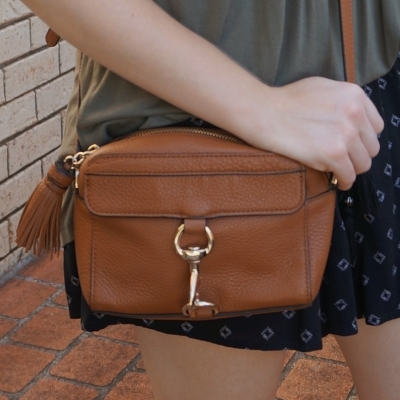 What's My Favourite Rebecca Minkoff Bag? Again with the same necklace! Although I didn't match it to my bag this time. Just like the last time I wore this olive tee and these black denim shorts together, I felt I needed to add a little something. Last time I added a light scarf for an extra colour and print, this time around I stuck with the navy colour but picked this pretty floral kimono instead. It's such a fun one to wear, the cocoon style is like being wrapped up in a big hug! 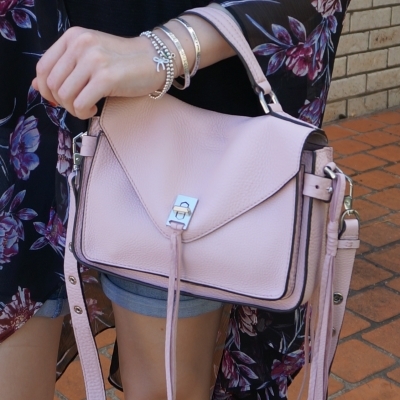 With the pink in the floral print, this neon pink mini MAC bag seemed like a good choice, and it really pops with the navy, olive and black neutrals. Just a normal quiet weekend, grocery shopping and swimming lessons, before trying to get more study in in the afternoon when the boys were at the park with their dad. 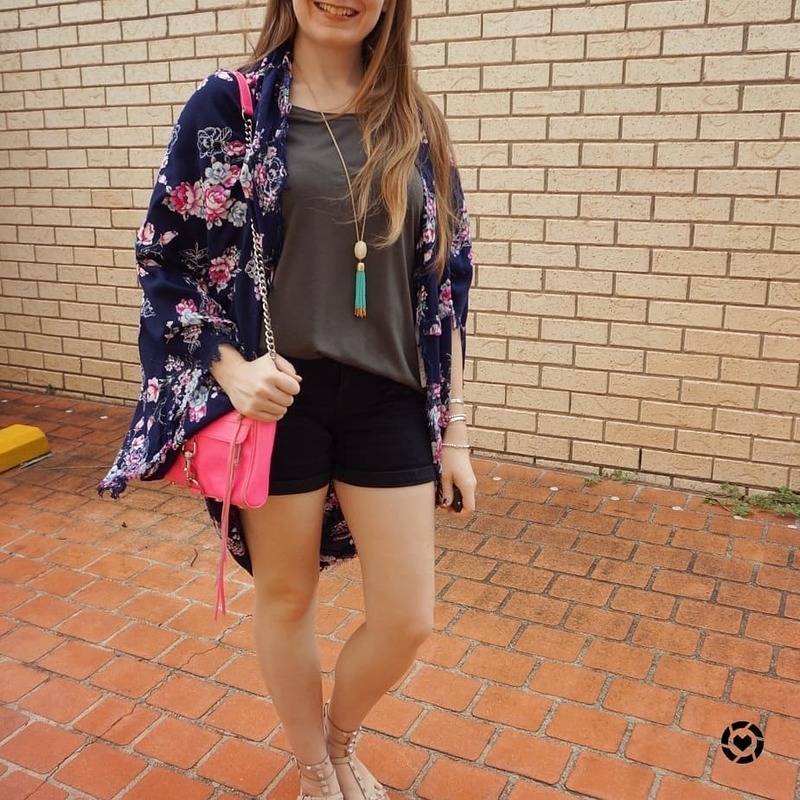 Last worn: navy floral kimono, turquoise tassel necklace (above), olive tee, black denim shorts, Rebecca Minkoff studded sandals, Rebecca Minkoff hot pink mini MAC bag. Other ways to wear: navy floral kimono and jeans, olive tee and pencil skirt, black denim shorts and printed tee, studded gladiator sandals worn 30 ways, Rebecca Minkoff hot pink mini MAC bag and embroidered top. 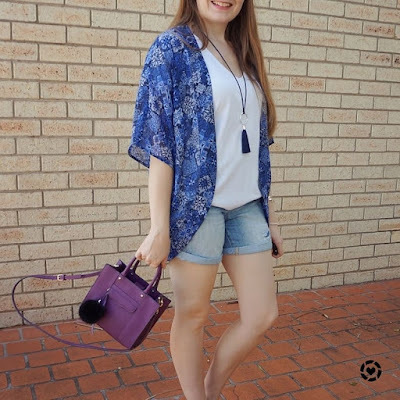 Perfect for pregnancy: navy floral kimono in second trimester..
A floral kimono is a fun way to add a little extra colour or interest to an otherwise plain jeans and tee outfit. You can match your accessories to the colours in the print like in the second outfit, or pick a completely different colour like in the first outfit, to add even more colour. 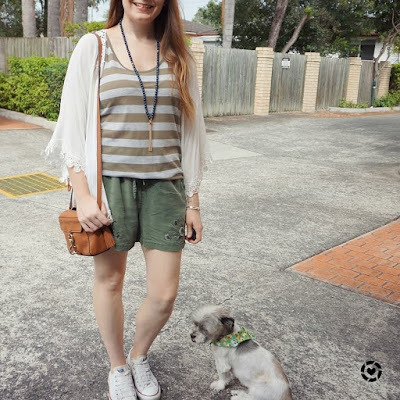 Linking up with Fashion Frenzy, Fashion Files, Chic and Stylish, Trendy Thursday, Weekly Link Up, Flashback Fashion, Lizzie In Lace. Although it's autumn in Brisbane, summer outfits can continue for a while before the really cold weather arrives! 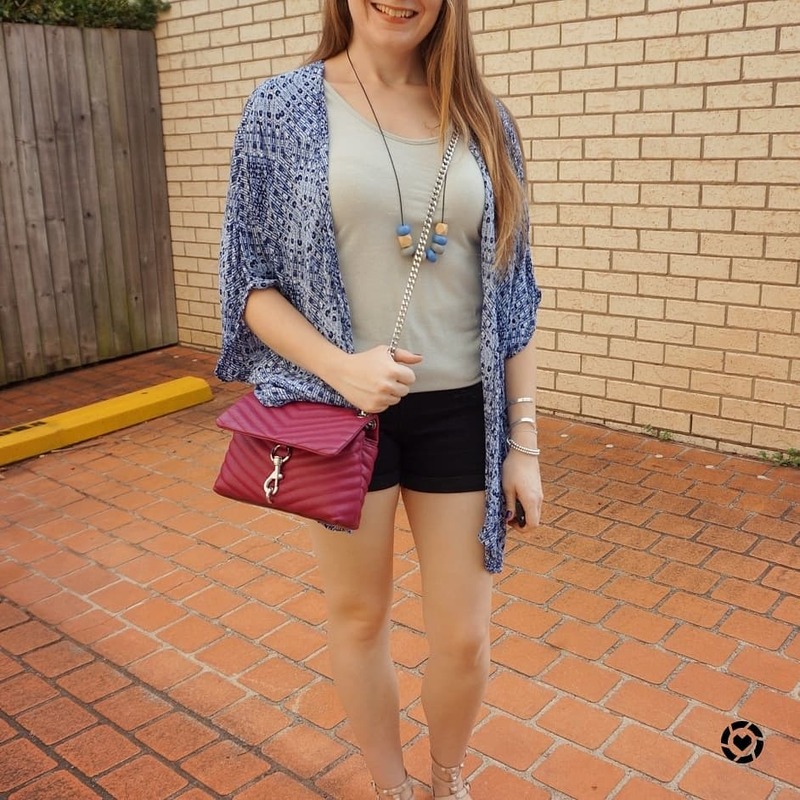 Simple tanks, printed kimonos and shorts with a cute colourful Rebecca Minkoff Edie bag are such easy stay at home mum outfits. I really liked this outfit, I thought all of the colours worked so well together. While the dominant colour in this printed kimono is purple, it has a bunch of other colours in it. 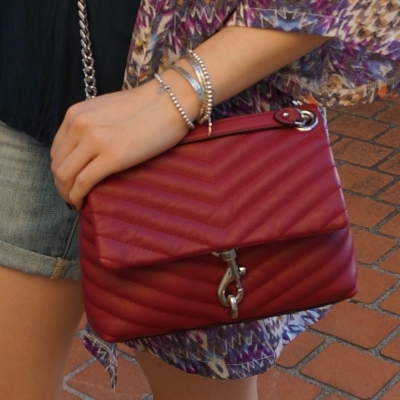 I couldn't resist adding more colour with this magenta Rebecca Minkoff Edie cross body bag. 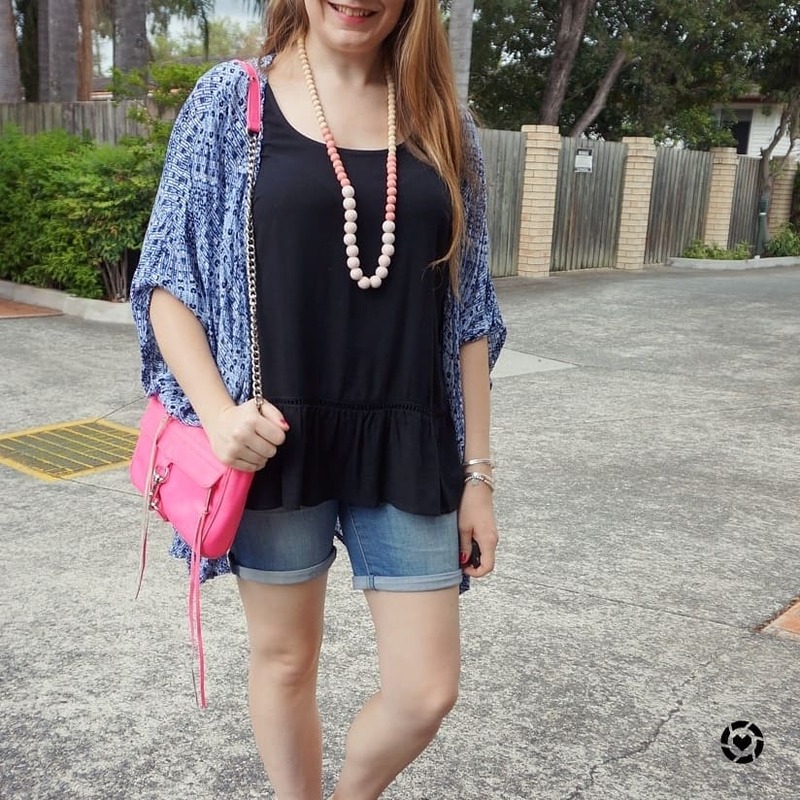 A neutral navy tank and blue denim shorts were an easy pairing with the rest of the colour. And then a blush necklace, for another little extra touch of colour. Just a quiet day, doing the daycare drop off and pickup and working from home, before taking my son to an appointment in the afternoon. Such a comfortable outfit for that. I did wish I had picked a different tank in the afternoon heat though - this one is an old breastfeeding one, it's layered with hidden access for breastfeeding and on a hot day layered tops are not the best! Such a cute basic tank though, I'm still keeping it around long after finishing breastfeeding as you wouldn't know just by looking at it that it's a special piece. 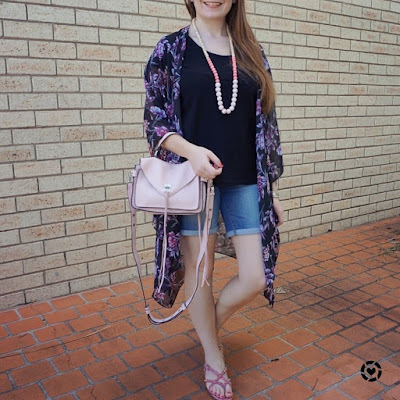 Last worn: blush tassel necklace, purple printed kimono, navy tank, boyfriend denim shorts, Havaianas, Rebecca Minkoff Edie bag. Other ways to wear: purple printed kimono with stripes, navy tank and striped duster for travel, boyfriend denim shorts and red scarf, Rebecca Minkoff Edie bag and maxi dress. Perfect for pregnancy: navy tank in second trimester. Another outfit with the same formula! A metallic tank this time, black denim shorts and a navy printed kimono. 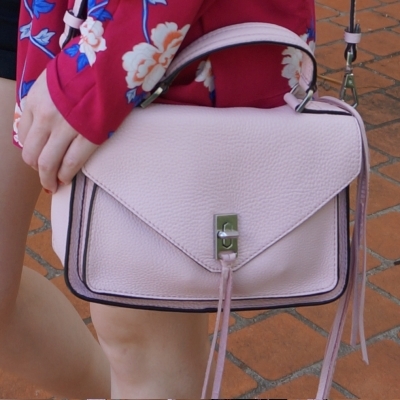 Again with the same magenta Rebecca Minkoff small Edie bag as, just like in the first outfit, I love how the magenta works with navy. Didn't like this outfit as much as the one above though - even with swapping the Havaianas for studded sandals, this outfit just felt a bit plain. Was nice and simple for a day with the kids though, doing our usual playground and library routine with a couple of errands to run too. Last worn: navy printed kimono, blue necklace, metallic silver tank, black denim shorts, studded gladiator sandals, Rebecca Minkoff Edie bag (above). Other ways to wear: navy printed kimono and pencil skirt, metallic silver tank and maxi skirt, black denim shorts and scarf, studded gladiator sandals worn 30 ways, Rebecca Minkoff Edie bag with turquoise. Perfect for pregnancy: navy printed kimono in third trimester. 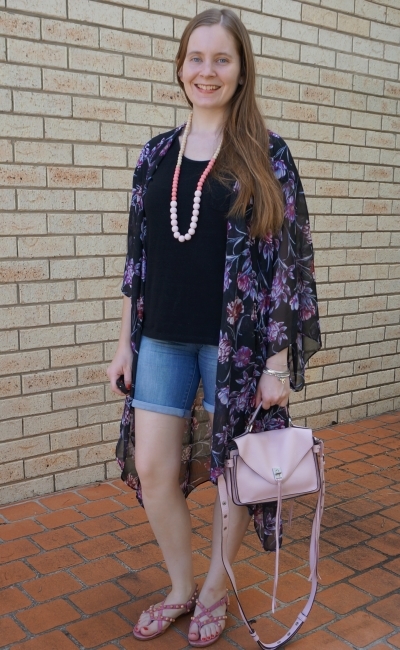 Kimonos aren't just a summer staple! They are an easy layer to add to a simple tank and shorts outfit for a little more colour and interest on milder spring and autumn days too. 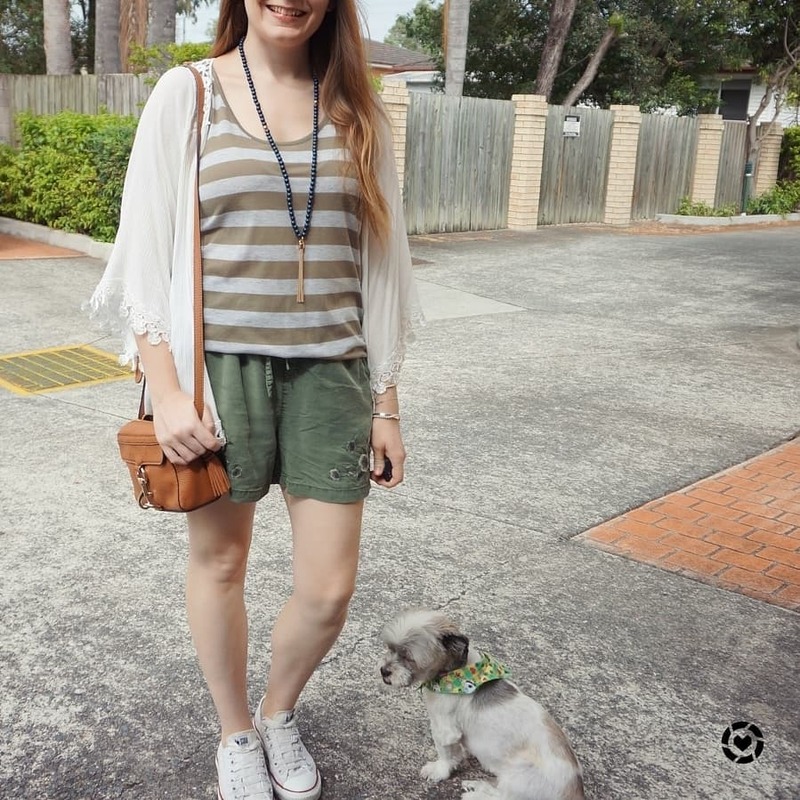 Linking up with Shoe & Tell, Sunday Reflections, On Mondays We Link up, Mutton Style. Two outfits following the same outfit formula but with different colour schemes! The first outfit is pink and purple and the second is purple again, but with blue instead. 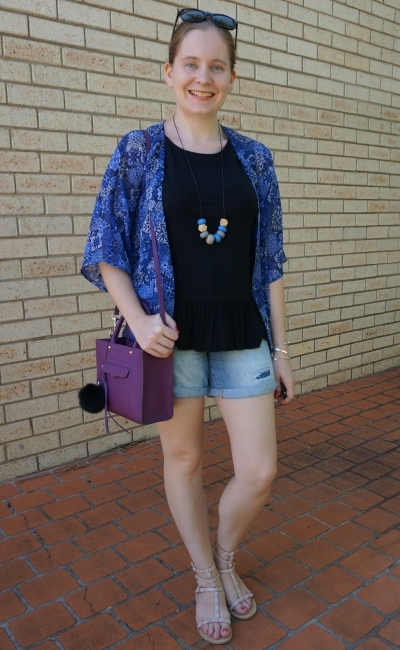 These simple shorts, tee and kimono outfits are a summer staple for me and perfect for mum life. I really liked this outfit. I like grey and pink together but this outfit felt it was lacking something until I added the kimono - the perfect touch! 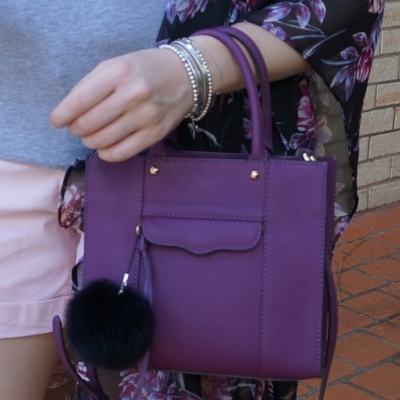 With the purple floral kimono, a purple mini MAB tote bag was the obvious choice to accessorise with. It was a busy day! We went to a local opshop I'd heard good things about but never visited. It's a little out of the way, but with clothes just $1 each was definitely worth checking out! As usual, I left with more things for the boys than me, but it was still a good trip and we will have to try go more regularly. I still haven't found the perfect alternative to my favourite opshop after it closed. Of course after spending time doing something for me in the morning, we had to go do something for the boys later. We visited a travelling petting zoo at a shopping centre, and it was so much fun. We all had a great time. I did regret my shoe choice as these studded Balenciaga sandals are maybe a little too delicate for straw and animals everywhere, and when I got a cup of animal feed spilled over me and into the cuffs of my shorts I regretted them a little too! But it was so much fun overall I didn't dwell on it for long! Last worn: floral kimono, pink and gold beaded necklace, grey v-neck tee, pastel pink shorts, Balenciaga studded sandals, Rebecca Minkoff Mini MAB tote bag. Other ways to wear: floral kimono and bermuda shorts, grey v-neck tee with green pants, pastel pink shorts and polka dots, Balenciaga studded sandals and tee dress, Rebecca Minkoff Mini MAB tote bag and maxi skirt. Perfect for pregnancy: grey v-neck tee in second trimester, Balenciaga studded sandals in second trimester, Rebecca Minkoff Mini MAB tote bag in third trimester. This day was not as exciting as the one above! Took the boys out to the library, the playground and then picked up some groceries on the way home. I really liked the outfit formula above though, so much that I repeated it again here, just changing the colour scheme a little. Blue and purple is another of those combinations that I love, so I kept the purple Rebecca Minkoff mini MAB tote bag and switched the purple kimono out for this pretty blue one and the grey tee for a white one. Blue denim shorts and just simple Havaianas made this a great outfit that follows the outfit formula above but created its own unique outfit I loved just as much. It's taken me a few years to face my fears and buy a white tee, but I'm glad I did, I really like this one from Atmos&Here and it works so nicely with blue! Last worn: blue kimono, white v-neck tee, navy tassel necklace, distressed denim shorts, Havaianas, Rebecca Minkoff mini MAB tote bag (above). Other ways to wear: blue kimono with stripes, white v-neck tee and pencil skirt, boyfriend denim shorts and scarf, Rebecca Minkoff mini MAB tote bag worn 30 ways. 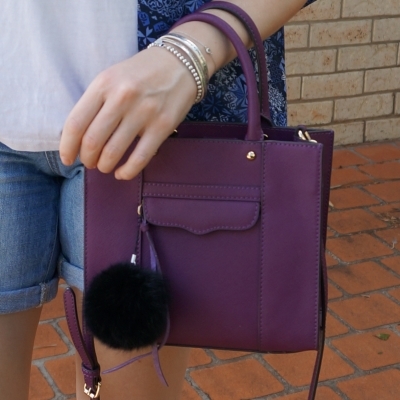 Perfect for pregnancy: Rebecca Minkoff mini MAB tote bag in thrid trimester. A plain shorts and tee combo is great in the summer heat. For a little more interest to your outfit, you can add a kimono. It's a nice, lightweight layer that makes your outfit a little more special without any extra effort. Linking up with Friday Faves, Sunday Reflections, Shoe & Tell.